We recently faced a conundrum here at the Sip Advisor headquarters: do we feature a bad drink? I work diligently to select drinks that I hope at least one sect of my fan base will enjoy and I think to this point, I’ve done a good job of making decent cocktails for all you little sippers. Heck, we made it to May before we had to address this issue. I’m not perfect, but I’m pretty close. Every drink I’ve made thus far has received a passing grade (although the Flatliner was close to having to attend summer school). That is, until I tried making the Greenback. At first glance of the name, I figured I could write about money and how I don’t understand so much financial mumbo jumbo. After one sip of this vile substance, I learned two things: bad cocktails are my kryptonite and I’d be crafting a post about when recipes go bad. 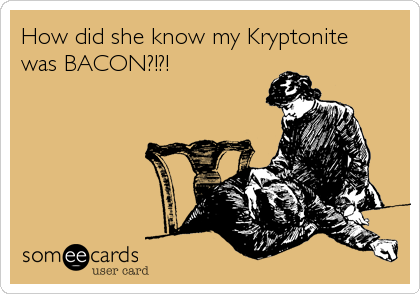 Bacon is my kryptonite too… just in a good way! 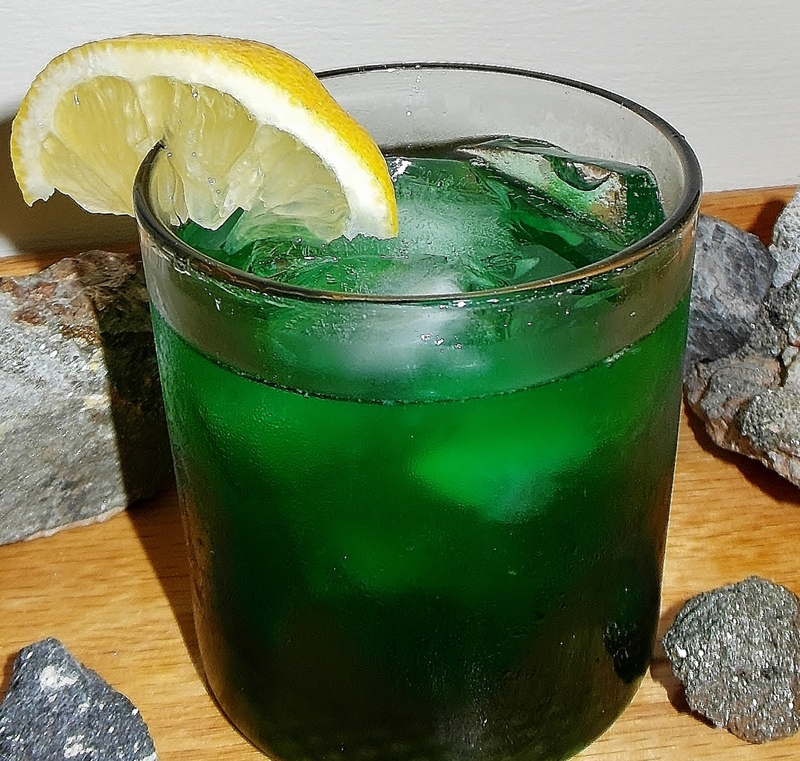 I had never tried Crème de Menthe, but I’ve seen it featured in a ton of recipes, especially ones to do with Gin, so I figured this was a tried, tested and proven drink. If it is tried and tested, those brave souls are surely dumb, deaf, and blind from the experience. This concoction is gross. I’m not sure I’ve had anything quite so disgusting and we’re talking about a guy who would make some Fear Factor winners blush with the list of things I’m willing to try. Unfortunately, not every drink that has a published recipe means that it is good (or at the very least drinkable). A lot of human error went into this mix and I’d love to meet whoever first invented it so that I could shake his hand… [Wait, remember Sip Advisor, you hated this drink]… Let’s try that again, using comedian Christopher Titus’ proposed Control-Z machine, which takes us back exactly 12 seconds into the past: so that I could stomp on his foot, forever sullying his pristine white shoelaces and while he’s looking down stunned, I would deliver the world’s greatest flying knee lift, ala Brutus ‘The Barber’ Beefcake. Would I be arrested on the spot, of course, but it would all be worth it to exact a small degree of revenge against this perpetrator. Plus, once I explained myself to the judge, she would surely let me off with a slap on the wrist and a “boys will be boys” chuckle. Plus, what she doesn’t know, is that I kind of enjoy a little light wrist slapping. This cocktail made me question whether I deserved the title of Sip Advisor. In a moment of total anxiety I burned all the merchandise concepts we eventually plan on rolling out through the site. I took my entire bar collection and threw it off our balcony. I even took my precious muddler and tried to flush it down the toilet. In the fetal position and with a flooding bathroom, Mrs. Sip tried to calm me down and restore my usual swagger. She reasoned that this is exactly what a Sip Advisor does. Tries the good and bad and lets the world know which is which (she may have even pointed out that the tagline of this site is in fact “The Good, The Bad, and The Bubbly”). She was right, I do look good naked (my mind always drifts off eventually). So, I know with this cocktail, you readers no longer view me as a hero. I will settle for being a nearly flawless individual who is responsible for so much good on this earth that it’s hard to fathom I’m merely mortal. I don’t even know why I’ve included the recipe. It should be scorched from the earth. If you do decide to take your life into your own hands and attempt making and consuming this drink, the risk is all on you. The Sip Advisor cautions that this beverage contains scenes of violence and coarse language (usually known as the good stuff, but not in this case). Viewer’s digestion is advised. On second thought, don’t worry about the coarse language because this drink is worse than having soap in your mouth! And that score is generous. This awful mess is basically a mouthwash – you spit and don’t swallow. And it does, in fact, taste exactly as if you are drinking mouthwash (I went and had some Listerine after to compare). 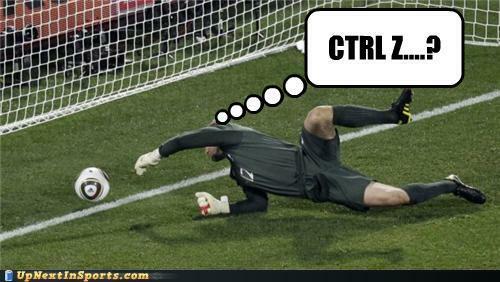 I feel I’m being too generous with giving it any score at all. Yuck! This entry was posted in Crazy & Classic Cocktails and tagged bad drink recipe, boys will be boys, Brutus ‘The Barber’ Beefcake, Christopher Titus, Control Z, Crème de Menthe, Fear Factor, Flatliner, gin, Green Back, gross drink, kryptonite, lemon juice, lemon wedge, slap on the wrist, summer school by Daniel Wilson. Bookmark the permalink.